The NHL postseason kicks off this week and we are partnering with our hometown Tampa Bay Lightning for an awesome deal on Monday, April 8. 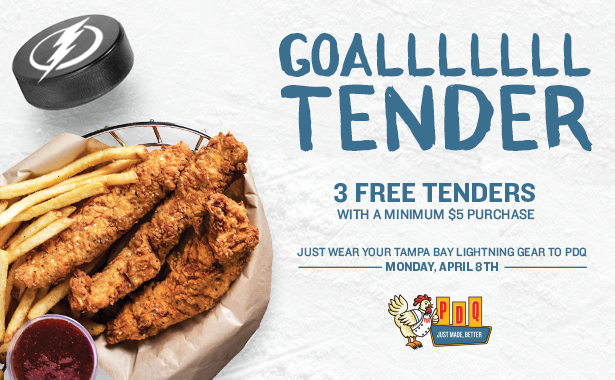 Guests who wear their Lightning gear to any Tampa Bay area PDQ location (including Pinellas County locations, Bradenton, Lakeland and Sarasota), on Monday will receive 3 Free Tenders with a minimum purchase of $5 all day long. For a list of locations, click here. So come out to PDQ for some great food and show your Lightning spirit too.